Remember to finish the Urn of Sacrifice quest before he leaves! No Land Beyond is a very unique weapon, but unfortunately not a good one. Similar to Vex Mythoclast or Universal Remote, it is a special (secondary) weapon that is used in the primary slot. We’ve reviewed this weapon fully upgraded, click here to check it out. You’ll have to work for every kill, but when you finally get into the weapon’s rhythm, it gives you a very rewarding/satisfying feeling. It fortunately does have the second highest Impact out of any sniper rifle (tied with Ice Breaker). Given you’re skilled enough to master the weapon, you may enjoy using it in PvP. In PvE however, there’s no good reason to use this as your primary weapon. What could have been a really fun weapon, is crippled by a low rate of fire and horrible ADS experience. Pass on this weapon, it’s currently not worth it, but keep in mind that it’ll most likely receive a buff eventually. Mulligan – Missing a shot has a chance to return ammo directly to the magazine. The Master – Increased precision damage. Kills briefly increase damage against next target. You already have this, right? The Armamentarium has perks mostly centered around carrying more, which is extremely versatile. This armor is built for those Titans who love to deal heavy damage. An additional grenade, with more heavy and special ammo means you’re a walking armory, ready to throw some serious punches. This week it comes with a decent stat roll of 138/149 Discipline, higher than the previous time it was sold. This chest is similar to the Crest of Alpha Lupi, in that it doesn’t provide any subclass specific upgrades – so feel free to use this on a Defender or Striker! Special Weapon Ammo – Increases the amount of Special ammo you can carry. Heavy Weapon Ammo – Increases the amount of Heavy ammo you can carry. Grenade Booster – Carry an additional grenade. A second grenade is so very useful in any and all situations. Even if you prefer your primary weapon, and might just capitalize on 1/3 of its perks, it’s still going to be a worthwhile investment. 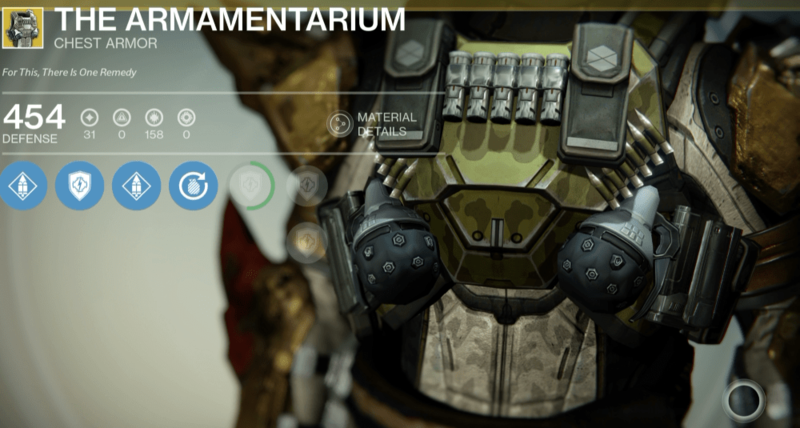 This is the ultimate Titan’s chest piece. If you’re not using your heavy and special weapon a lot, you should still buy this for its high discipline and additional grenade! 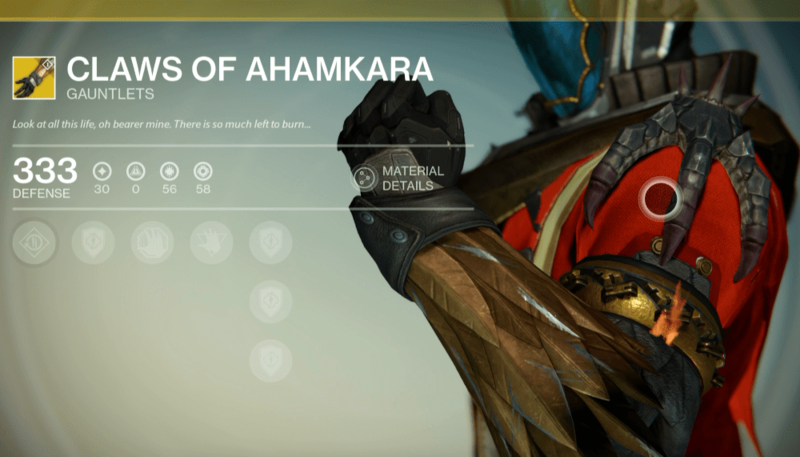 In addition to the Obsidian Mind, the Claws of Ahamkara were introduced with The Dark Below expansion. These gauntlets have 49/52 Discipline and 49/52 Strength – lower stats than the last time they were sold. Snap Discharge – Increases melee attack speed. The Whispers – Gain an additional charge for Scorch and Energy Drain. These are a must-buy. 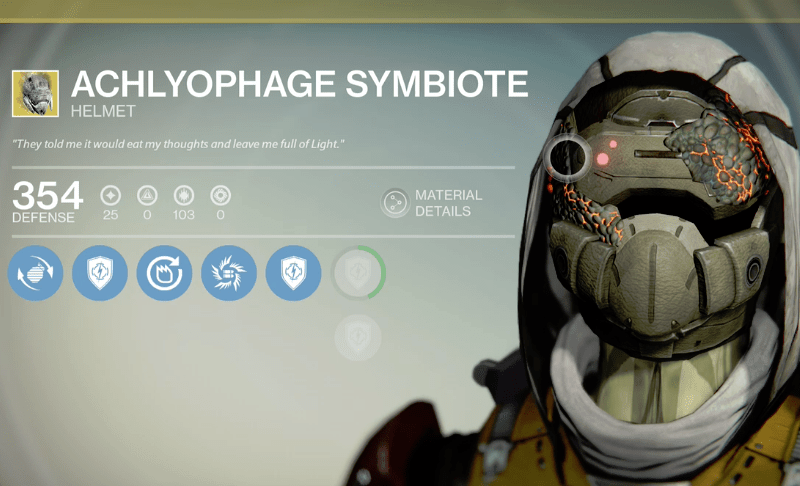 The perks will help out in PvE and PvP, and the they also look great. The Warlock melee is one of the strongest in Destiny, and having two charges makes it even better. If your melee ability isn’t up, these will help you squeeze out in a close quarters fight with their increase to melee attack speed. The increased reload to special weapons is also handy for just about every situation. What makes these especially awesome, is that they’re equally useful for both subclasses. I’d prefer to use these on a Sunsginer for the extra Flame Shield. This helm is strong in both PvE and PvP, and is worth buying, but it certainly depends on how much you value the Golden Gun. This week it’s got a 87/93 Discipline, which is lower than its been in the past. If you’re a Gunslinger without Exotic armor, this is definitely a good one to grab.